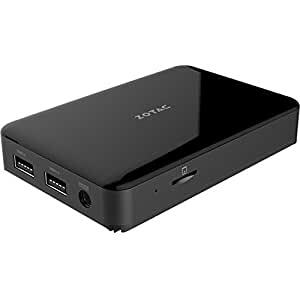 ZOTAC ZBOX-PI335-W2B Intel Processor N3350 1.1GHz/4GB LPDDR3/32GB eMMC/No ODD/Windows 10 Home Mini PC. Manufacture Part Number: ZBOX-PI335-W2B. Processor: Intel Processor N3350 (1.1GHz Clock Speed, 2.4GHz Max Turbo, Dual-core) Chipset: Intel. Memory: 4GB LPDDR3. Graphics Module: Intel HD Graphics 500. Hard Drive: 32GB eMMC. Optical Drive: N/A. Audio: headphone/microphone combo jack. LAN: Integrated Gigabit Ethernet Controller; 802.11ac Wireless LAN; Bluetooth 4.2. Ports: 3x USB 3.0 Ports (1 Type-C), 1x HDMI Port, 1x DisplayPort, 1x RJ45 LAN Port, 1x Internal Antenna. Connector, 1x headphone/microphone Combo jack Card Reader: Supports Micro SD/SDHC/SDXC Power Supply: O/P – 5V DC/4A Dimensions: 4.53 x 2.99 x 0.81 inch/115.0 x 76.0 x 20.7 mm Operating System: Windows 10 Home Pre-installed 64-bit.